Editor's Note: Dissident Voice considers Thomas Frank one of the finest and wittiest writers on politics and culture today. He is a founding editor of The Baffler magazine, and author of the must-read books One Market Under God: Extreme Capitalism, Market Populism, and the End of Economic Democracy and The Conquest of Cool: Business Culture, Counterculture, and the Rise of Hip Consumerism. 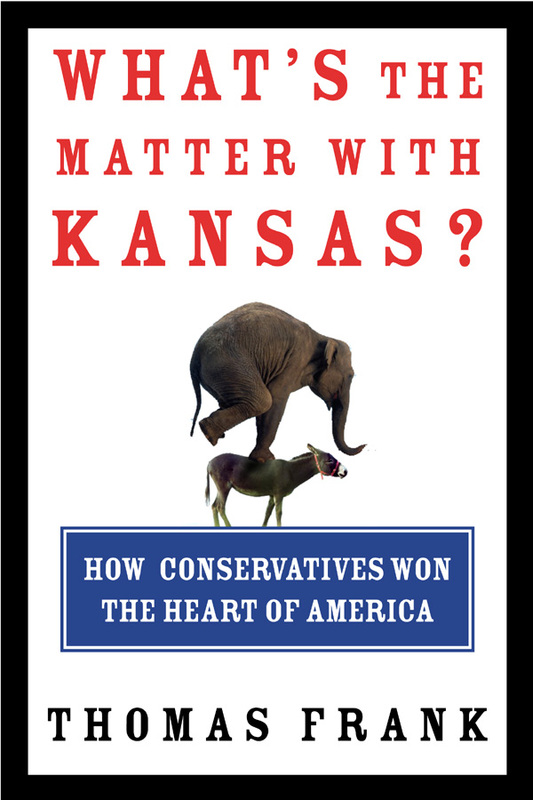 His latest book is What's the Matter With Kansas? : How Conservatives Won the Heart of America (Metropolitan Books, 2004). By far the best and most insightful book I've read in a couple of years. Frank uses Kansas as a metaphor for the rest of the country in order to examine why so many working and middle-class Americans consistently act against their own self-interests. The following is a publisher's interview with Thomas Frank. Thanks to Henry Holt and Co. When you ask, What's the Matter With Kansas?, do you just mean the rectangular state in the middle of the country, or is Kansas symbolic of something larger? In the book I do discuss certain events and personalities in the actual state of Kansas, but I also use “Kansas” as a metaphor for the U.S.A. According to journalistic convention, Kansas is the distilled essence of the country, the very heart of America. It’s a perfect microcosm, the place we look when we want to ponder the big question of who we are as a people. Incidentally, this is not only a journalistic convention, but a marketing one, too: Kansas is dead-average in so many statistical ways that it is a natural choice for test-marketers looking to see how some new product—a just-invented McDonald’s sandwich, say—will play in Peoria. And so what is the matter with Kansas? The same thing that’s been the matter with America for so many years: the culture wars. The cloud of inexhaustible right-wing outrage that hovers over so much of the country. Kansas, like many places in America, once had a tradition of progressivism and outright radicalism. Today, though, like many other places, the state’s political center just seems to move farther to the right in response to events. During the Nineties the state erupted in a sort of right-wing populist revolt, tossing out its old-school pragmatic leaders and replacing them with the most conservative Republicans available. It made national headlines when anti-abortion activists descended in massive numbers on Wichita in 1991, and it made world headlines when its State Board of Education took up the battle against evolution in 1999. Today Kansas is the sort of place where the angry, suspicious worldview typified by Fox News or the books of Ann Coulter is a common part of everyday life. So I went there to study the indignant conservative mindset up close. The reason I say there’s something “the matter” with all this is that, in becoming more and more conservative, Kansas is voting against its own economic interests. Large parts of the state are in deep economic crisis—in many cases a crisis either brought on or worsened by the free-market policies of the Republican party—and yet the state’s voters insist on re-electing the very people who are screwing them, running up colossal majorities for George Bush, lowering taxes and privatizing and deregulating, even when these things are manifestly unhealthy for the state. After the last election we heard a lot about a cultural conflict between the “red states” that voted for George W. Bush and the “blue states” that voted for Al Gore. Is this what you’re getting at with your book? Yes, but not in the usual way. When some pundit starts talking about the red states versus the blue, what they’re usually trying to do is associate president Bush with the humble, “heartland” values of the Midwest and thus give him the grassroots legitimacy that, as a minority president, he does not enjoy. (At the same time, they are usually also trying to smear his opponents by associating them with the corruption and snob tastes of the Eastern cities.) My own take is different. I point out that the “heartland” isn’t that simple; that you have corruption and snob tastes in Republican Kansas just like you do in New York, and that in certain cases, the Republicanism of these salt-of-the-earth red states is downright self-destructive. This is a book about good people in hard times who, despite noble intentions, have made terrible choices. While I liked many of the conservatives I met in Kansas, and while I have a deep affection for the state—after all, it’s my home state—this is not one of those fake-populist books celebrating the nobility of the eternal heartland or praising Wal-Mart or supplying the recipe for grandma’s special casserole. Your title, What's the Matter With Kansas?, comes from a famous 1896 essay by William Allen White. What statement are you trying to make by echoing White? When he wrote the essay, “What’s the Matter With Kansas?”, William Allen White was a conservative editor of a small-town newspaper who was outraged by the wave of Populist sentiment that was then so powerful in Kansas. In the 1890s, remember, Populism was a movement of the left, fighting “the elite” by demanding things like a federal farm program, national ownership of the railroads, fair play for labor unions, an income tax, and a fiat currency. (All things which were partially achieved in later years.) In his essay, White angrily berated these radical Kansans for making the state look bad in the eyes of big money and thus for bringing economic ruin. It was a powerful piece of work, and it became an instant classic, reprinted in huge numbers by the McKinley campaign for use against the Democratic and Populist candidate, William Jennings Bryan. Today’s conservative Kansas rebels are politically the exact opposite of the rebels of 1896, trying to reverse or destroy the achievements of their ancestors. They most definitely are bringing ruin on the state. And yet while they do so they constantly use the class-war language of populism, always depicting Republicanism as a movement of regular folks overthrowing the haughty impositions of the “liberal elite.” The worst offender in this regard is George Bush himself, who complains about being the victim of liberal-elite snobbery even while he works to make the country’s real elite more of an elite than ever. His political managers, meanwhile, love to compare their man to the pro-business William McKinley, the guy who beat the original Populists, even while they endlessly salute the “heartland” values of red-state America. So how could I not use White’s title? The historical parallels and reversals are just too many to resist. One of the words you use a lot in the book is “backlash.” You talk about “the Great Backlash,” “backlash conservatism,” and a “backlash mentality.” What do you mean by this? By “backlash” I mean populist conservatism of the kind pioneered in the Sixties by George Wallace and Richard Nixon, perfected by Ronald Reagan and George W. Bush, and crafted into an entertainment form by Fox News. Instead of selling conservative politics on economic grounds, it imagines conservatism as a revolt of the little people against a high and mighty liberal elite. Its object is to fight back against artists who dip crosses in urine, Hollywood stars who wear outrageous clothes, Ivy League journalists who slant the news, and snob judges who remove Ten Commandments monuments from the parks, and so on. The “Great Backlash” refers to the long ascendancy of this style of conservatism, ever since 1968. The “backlash mentality” refers to the culture of the movement, to the way its members view the world we live in. The backlash is so commonplace and so universal today that it’s sometimes difficult to remember how strange and how historically recent it is. Before the Sixties, the working class was something conservatives wanted nothing to do with; today conservatives talk about the honest, hard-working people of “red America” as though they were the GOP’s natural constituency, while ignoring the nuts and bolts of economic issues. At times in the book you describe the backlash as a cultural phenomenon. What are some of its main characteristics? The basic cultural earmark of the backlash is its constant use of the language of class conflict. It understands liberalism as the imposition of an elite, not as something constructed over the decades by working-class people, minorities, and environmentalists. Liberals are parasites, it insists, pressing their idle schemes down on the hard-working world. Another peculiarity of the backlash is its fantasy of victimhood. Populist conservatives understand themselves as people with a terrible grievance against society, against a liberal order that insults them, discriminates against them, and even persecutes them. They are chronically outraged, offended by everything, but also convinced that they are powerless to change the world. Finally, they are deeply anti-intellectual, hostile not only to elite college teachers but to the professions generally and, beyond that, suspicious of most complex explanations for how the world works. As I note in the book, this is a curious set of beliefs for a faction that has enjoyed such spectacular political success in the last thirty years. So if we want to understand why America has moved so sharply to the right since the Sixties—and why it has pushed the world in the same direction—I believe we must start by examining the backlash. You say that you have a special, personal insight into the backlash mentality. How so? I grew up in suburban Kansas City, a place where the backlash grievance is sometimes second nature, and as a schoolboy in the Seventies and Eighties I embraced the backlash worldview with the zealotry of a true believer. I was a Reagan youth. So I believe I understand the sense of frustration from which the backlash arises and the fundamentally decent democratic impulses—the hair-trigger suspicion of “elites,” for example—that it builds upon. My subsequent personal experiences, such as my later turn to the left, are also why I persist in believing that many backlash voters can be brought back to the liberal fold. That is, they could if there were any politicians out there willing to make the effort. How did liberals let all this happen, and what can they do to remedy the situation? There is no doubt that liberals bear a lot of the blame for the backlash. Back in the Sixties and Seventies, Democratic Party leaders decided to turn their backs on the working-class voters who until then had been the party’s central constituency, and to try to find a new constituency in groups like college students, environmentalists, and so on. They called this the “New Politics,” and it was a terrible mistake. Among other things, it is one of the sources of the “liberal elite” stereotype, in a historical sense. And while there have been numerous Democrats who have tried to resurrect the alliance with the working class over the years, the dominant, Clinton wing of the party clings to this failed strategy. They essentially agree with the Republicans on economic issues, write off the working class, and try instead to win the votes (and the campaign contributions) of educated, professional people by taking liberal stands on social issues. Their idea of politics is a war of enlightened CEOs versus backwards CEOs. This strategy has been disastrous in the extreme. While stripping away any economic reason for working people to vote Democratic, it has simultaneously played into the “liberal elite” stereotype which is the Republicans’ strongest weapon. The result is what you see around you: Republicans talk constantly about class grievances, albeit in a coded and inverted way, while Democrats never bring it up at all, desperately trying to prove their “centrist” bona fides. What liberals must do to beat the backlash, it seems obvious to me, is to resurrect old-fashioned, upper-case-P populism, and to wage non-coded, non-inverted class war. They must at the very minimum counter Republican appeals to social class with their own appeals to social class. In your other books you have written about the use of countercultural language by the advertising industry (The Conquest of Cool, 1997) and the use of liberationist language by Wall Street and corporate management (One Market Under God, 2000). What connects those books to this one? All three books are about the colossal abuse of the language of democracy in the aftermath of the Sixties. And all three are about the many bizarre cultural inversions of the world we live in: Consumerism as nonconformity; Wall Street as an ally of the common man; the CEO as Deadhead—and now, the Republicans as the party of the working class. In other words, they’re all about the sheer weirdness of our times. We inhabit a nation where the culture screams constantly about how rebellious and nonconformist and Xtreme we are, but where the politics constantly move to the right. My larger point is that these two aspects of our times are connected to each other; that our pseudo-revolutionary culture in some way helps to generate our reactionary politics, and vice-versa. We talk a lot about both parts of American life, but always separately—pondering one in the front pages and the other in the “Business” or “Style” section. My object is to consider both at the same time, to point out that these two aspects of America thrive symbiotically on one another’s excesses. The white-collar rebels shock and annoy the pious; the blue-collar Republicans are duly shocked and annoyed; and they vote to shower even more power, more tax cuts, more deregulation, on the white-collar rebels whom they despise so deeply. This topsy-turvy system works. How was the food in Kansas?